Representative Honours: Northern Ireland: 1 Full Cap (1956); Irish League: 21 Caps / 8 Goals (1950-1963). Club Honours: (with Brantwood) Irish Intermediate League Champion 1947/48; Clements Lyttle Cup Winner 1947/48; (with Linfield) Irish League Champion 1949/50, 1952/53, 1954/55, 1955/56, 1958/59, 1959/60, 1960/61, 1961/62; Irish Cup Winner 1949/50, 1952/53, 1959/60, 1961/62, 1962/63, Runner-Up 1957/58, 1960/61; Gold Cup Winner 1949/50, 1950/51, 1955/56, 1957/58, 1959/60, 1961/62, 1962/63, 1963/64; Ulster Cup Winner 1955/56, 1959/60, 1961/62; City Cup Winner 1949/50, 1951/52, 1957/58,1958/59, 1961/62, 1963/64; Co. Antrim Shield Winner 1952/53, 1954/55, 1957/58, 1958/59, 1960/61, 1961/62, 1962/63; North-South Cup Winner 1961/62; Intermediate Cup Winner 1948/49*, Steel & Son Cup Winner 1948/49*. 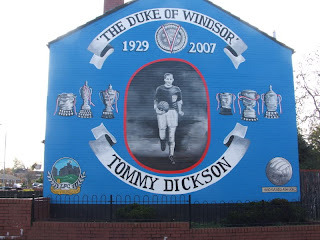 A product of the Roosevelt Street Boys’ Club, located just a mile from Windsor Park where, Tommy Dickson was already impressing as half-back and inside-forward whilst in his mid-teens. He took the next step in his footballing journey when, as a 17 year-old, he was signed by intermediate side Brantwood, helping them to Intermediate League and Clements Lyttle Cup successes. By then Dickson was drawing the attentions of the big clubs, Belfast Celtic’s manager Elisha Scott offering him £600 to sign as a professional, before Linfield’s Jock Hutton persuaded him that Windsor Park was the place to play. At Linfield Dickson served an early apprenticeship with the Swifts, adding Intermediate and Steel & Sons Cup winner’s medals in his first season, before promotion to the first eleven in the wake of George Hannah’s departure for Newcastle early in the 1949/50 season. For the next fifteen years Dickson was an ever-present goal threat as Linfield claimed title-after-title and cup-after-cup. He reached his pinnacle when, as captain, he led Linfield to a seven trophy haul in 1961/62, his 38 goals - including those in the Irish Cup, Gold Cup and Co. Antrim Shield finals – a key feature of the clean-sweep. Although Dickson never actually topped the Irish League’s goalscoring charts in a particular season, his unerring strike rate and longevity have ensured a place in the top-five all-time list of Irish League goalscorers. Capped just once by Northern Ireland, Dickson’s run-out in a 1-0 defeat by Scotland in November 1956 proved an unhappy event. The heavy Hampden playing surface and the sending-off of Tom Casey meant Dickson had to play in a more defensive role to which he was not best suited. Much rumour and innuendo has surrounded the reasons for which the Duke was not given another chance in a side that needed goals. Suggestions of a falling out with captain, Danny Blanchflower, over perceived belittling – Danny is alleged to have addressed Dickson as “Lad”, to which he didn't take too kindly. Later Tommy Casey would recall Dickson as being streets ahead of most of the team in terms of ability, but that he was never shy about letting them all know. Although Dickson found that he was somewhat stifled at international level, with the inter-League set-up his successes were more notable. A thirteen year Irish League representative career brought him eight goals, none more historic than his brace in an famous 5-2 defeat of the Football League in April 1956. Six months later he scored against the Football League again, as the Irish ran them close at St James’ Park, Newcastle, before eventually losing 3-2. It was performances such as these that saw Dickson’s name continuously linked with a move across the water, Rangers showed some interest, and Hull City’s £8,000 bid was turned down as it didn’t meet Linfield’s £10,000 valuation. 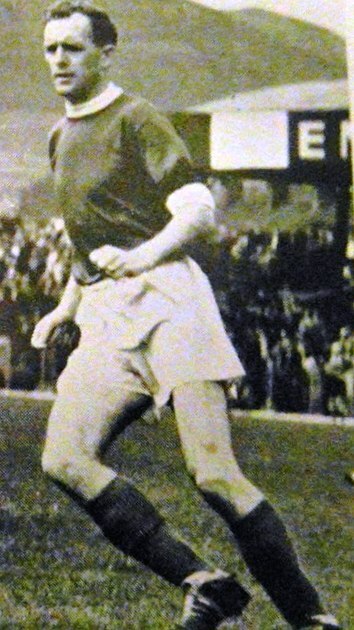 For a spell in the early-sixties Dickson operated as Linfield’s player-coach, and was responsible for team selection (but not transfer policy). He left this role in frustration, after a slump in form in the early part of the 1962/63 season. His form recovered, and Linfield marched on to amass a wealth of honours before he eventually left in 1965. The manner of his departure from Linfield was both dramatic and shocking. The drama was the board’s announcement that he would not be retained for the 1965/66 season, the shock was that Gibby Mackenzie persuaded him to sign for Glentoran! As it was, Dickson’s spell at the Oval was short, his heart wasn’t really with his new club, and he played just nine games before retiring. Tommy Dickson passed away on 31 December 2007 at the age of 78 following a long illness.